I've missed this book. I've missed books like this so much. I've missed seeing Lobo portrayed as the dirtiest, meanest and baddest biker in the universe. I've missed seeing Harley Quinn portrayed as brilliant and fun-loving. I've especially missed seeing Green Arrow and Black Canary together as a loving couple. Ironic, isn't it? That so many of us DC Comics fans have become enraptured by a comic set in the dystopian future of an alternate universe that somehow manages to be more optimistic and fun to read than the vast majority of the comics set in the New DC Universe? That Tom Taylor somehow manages to take the essence of our favorite characters and remain true to it - even Superman's character - while still telling a tale like this one? The basic plot of this issue is simple enough. Lobo shows up on Earth looking to collect a bounty on Superman. 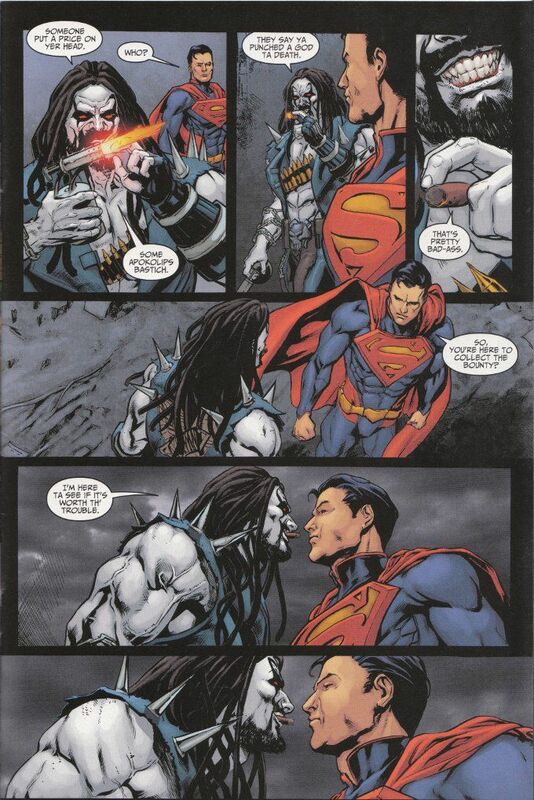 Superman persuades Lobo that it would be more profitable to hunt down Harley Quinn. Lobo finds Harley and hilarity ensues. 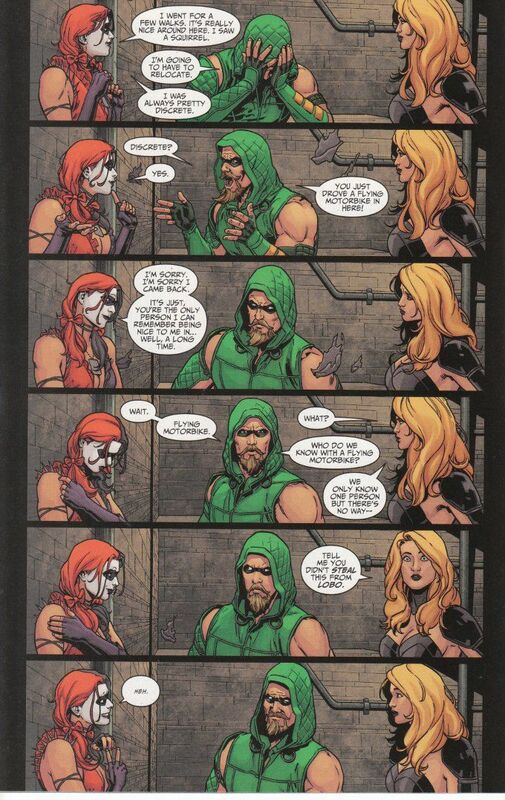 Oh, and Green Arrow and Black Canary are dragged into this before the story is over. The artwork is as impressive as the story, despite being handled by four separate teams. The story is broken up in such a way that the differences in art go along with changes in location and action. Xermanico, most recently seen on the Arrow web comic, pencils and inks the greater portion of the first half of the comic, with Jonas Trindade assisting on inks when Lobo first confronts Harley. Mike. S. Miller - one of the regular artists on the Injustice title - handles a dynamic action sequence where the tide turns in the battle between Harley and Lobo. Bruno Redondo - another Injustice regular - closes the book out with the sequence where Green Arrow and Black Canary join the fight. If you have yet to experience the world of Injustice: Gods Among Us, this issue is a surprisingly good introduction to the setting. It's also a must read for all fans of Green Arrow, Black Canary, Harley Quinn, Lobo and anyone who misses the DC Universe of 2010. It's a fun read and a reminder of better days.